Canada has become the most adorable migration country and people from developing countries desire to settle there. Plethoras of folks have migrated to Canada and want to sponsor their loved ones whom they are divided from. The Canadian Spousal Sponsorship program helps you reunite with your family members overseas, so that you can continue your life together in Canada. Spousal sponsorship lawyer in Canada provides assistance to permanent residents of Canada and Canadian citizens in sponsoring their foreign partners and obtain them permanent resident status in Canada. How to Sponsor your spouse for Canada PR? Sponsoring your spouse to Canada is not as easy as it seems, it needs a lot of advance preparation and documentation. You will have to show your legal marriage certificate as well as you need to prove the authenticity of your relationship. Documents to show genuineness can range from messages to gift receipts. Immigration officers may examine each and every thing related to your relationship or marriage. 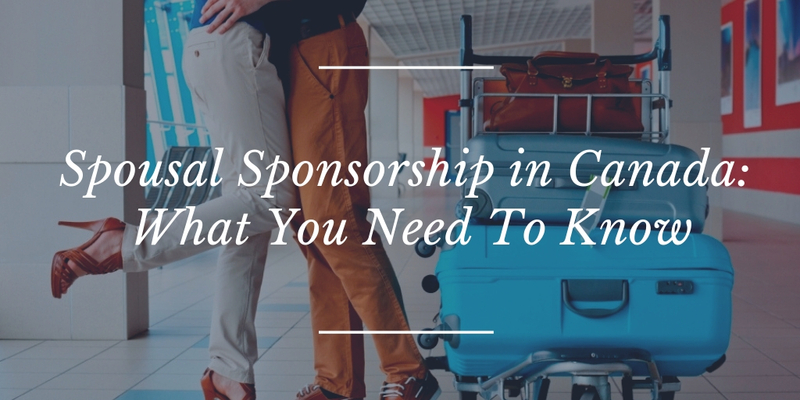 There is certainly a distinction between sponsoring a spouse overseas vs. from within Canada. There are definite advantages and disadvantages to each of these applications. If your other half currently lives in Canada, this is called an inland application. Under this program, your spouse cannot leave Canada until the application is processed. If they do so, there application might be abandoned. On the contrary, when your spouse resides abroad or outside of Canada, this is called an overseas application. Once you have submitted your application in Canada, then it will be moved to a visa office overseas for further processing. In this way, your application is assessed in two parts. Initially, the sponsor is assessed, once approved, then the application is sent to the visa office of your spouse’s country for further processing. Permanent residency applications have wide processing times and it may take up to 2 years. The processing time of an application utterly depends on the factors of your exceptional case. Thus, make sure to prepare a strong application to avoid undue processing delays. If you want to get the best assistance regarding application filing, you can contact the spousal sponsorship lawyer in Canada. Matthew Jeffery is a professional attorney in all areas of Canadian immigration law, including Skilled Worker, Family and Spousal Sponsorships, Permanent Resident Card renewals, Canadian Experience Class and Express Entry applications, Citizenship applications, Work Permits, Study Permits, Humanitarian applications and Visitor Visas.